“This Kangri has become a source of costumer puller for us,” says Qazi Mudasir, who is a salesman at the shop. Junaid had to search the best artist who would agree to make “such a big” Kangri because, Junaid says, “all Kangri makers said it is a “difficult task” to weave a Kangri beyond a limit. The maximum length of a wicker that is used to make Kangri is 4-5 feet. “All those Kangri artists who we consulted said it is almost impossible to make seven feet tall Kangri, without using adhesives,” claims Junaid. 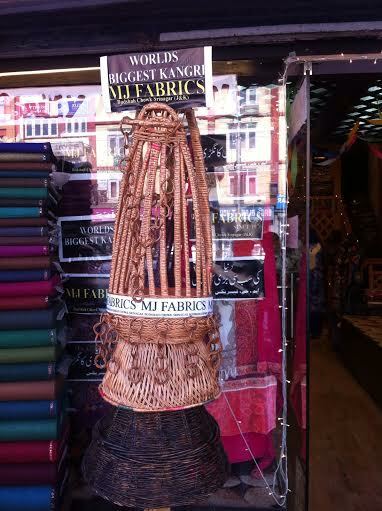 Eventually this one of its kind Kangri was placed for showcasing outside Handoo’s shop two months ago. “This is here just here for exhibitory purpose and not for sale as some people have approached to buy it,” says shop owner Sarfaraz Handoo. So is the Kanger to a Kashmiri”.